This beautiful villa style home is situated in the popular suburb of Kew and has amazing night and bay views. Drive up the drive, where we offer off-street parking for a maximum of 3 cars, to get easy access to the house. From the moment you enter this house, you will feel at home. The house is beautifully furnished and thoughtfully decorated and equipped with everything you could ever want. 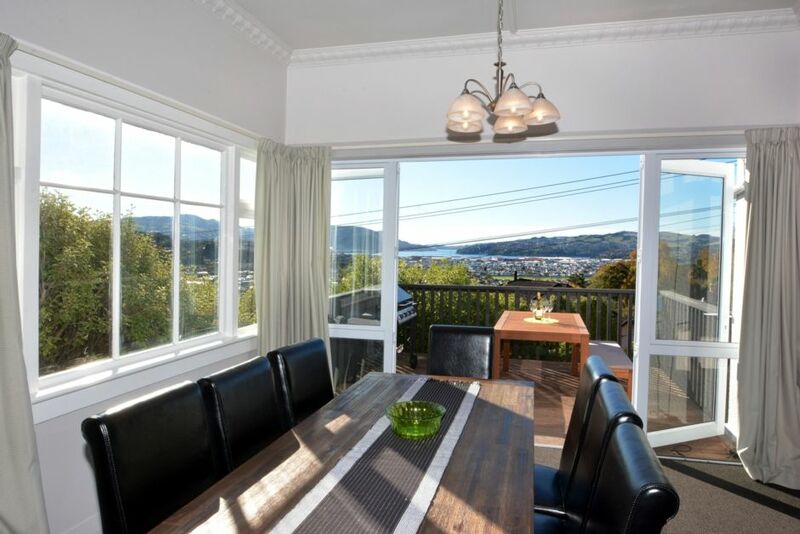 No matter where you are in the the open plan living and dining area, there are views galore. The living area has seating for 8 people, offers SKY TV including SKY SPORTs, wireless internet and also a DVD player with a collection of DVDs for young and older. There are also toys for the kids to play with. The dining area, right in front of the big verandah also seats 8 people. The kitchen is fully equipped and is very modern. There are 3 bedroom, 2 have queen sized beds and the 3rd has 2 single beds. Our brand new bathroom has 2 basins and an oversized, very comfortable shower. Theres is also another separate toilet. Kew is located right next to St. Clair and its famous promenade. From the house, you will only need 5 minutes to get to the city Centre. There are also shops in close proximity. Please note that special rates may apply, please enquire by email. On occasion, higher rates may apply if there is a special event on in town or on public holiday weekends. Should you wish to stay for 1 week or more, the weekly charge is $890 for 2 people. Quiet location, and very easy to find. It's not within walking distance of the city centre or station, but is only about 5/10mins drive and it's an easy journey. Location is residential, and parking is very good, be prepared to walk up hills as there are lots. Great location with excellent views. Love staying at this house when we visit Dunedin. It's in a handy location and is great for the family. Lots of space for the boy to play and the chromecast is an added bonus.